Just hours after Seagate showcased a 60TB SAS solid state drive at the Flash Memory Summit, Samsung announced a 32TB model, the PM1643, which it claims is the world's largest SSD to be based on 512-gigabit V-NAND chips. The difference is in the form factor (2.5-inch for Samsung and 3.5-inch for Seagate), and the fact that it uses its own 512-gigabit chips, compared to 384-gigabit Micron-sourced chips for Seagate. So while Seagate has the highest capacity, Samsung has the bragging rights when it comes to data density (which is ultimately what counts). The drive uses Samsung's new fourth-generation V-NAND stack, which boosts the number of layers to 64, enabling the production of 512-gigabit chips. 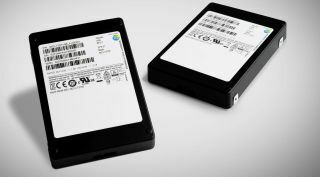 Samsung also confirmed that it is expects 100TB SSD to be available by 2020, although depending on market conditions we could reach that capacity far faster, especially if Samsung plans to produce a 3.5-inch version of the drive. The 32TB drive, which has yet to be named, will be shipped next year. Pricing has yet to be confirmed, but we wouldn't expect it to cost less than $20,000 (about £15,200, AU$25,800) given that a 15.36TB model from Samsung costs just under $10,000 (about £7,600, AU$12,900).